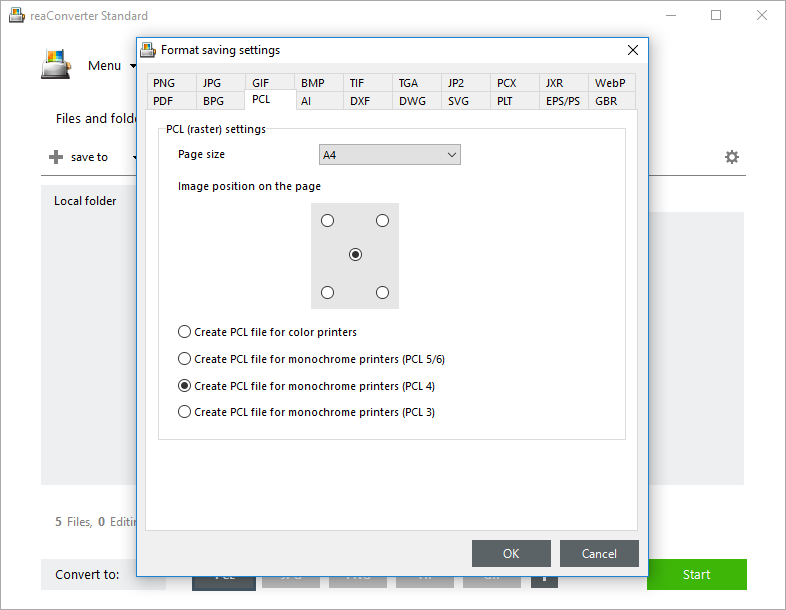 reaConverter’s latest edition helps you manage PDF to PCL conversion in no more than a few clicks and also allows you to customize the process by picking the desired output page size, positioning the image or designing the PCL for monochrome or color printers. 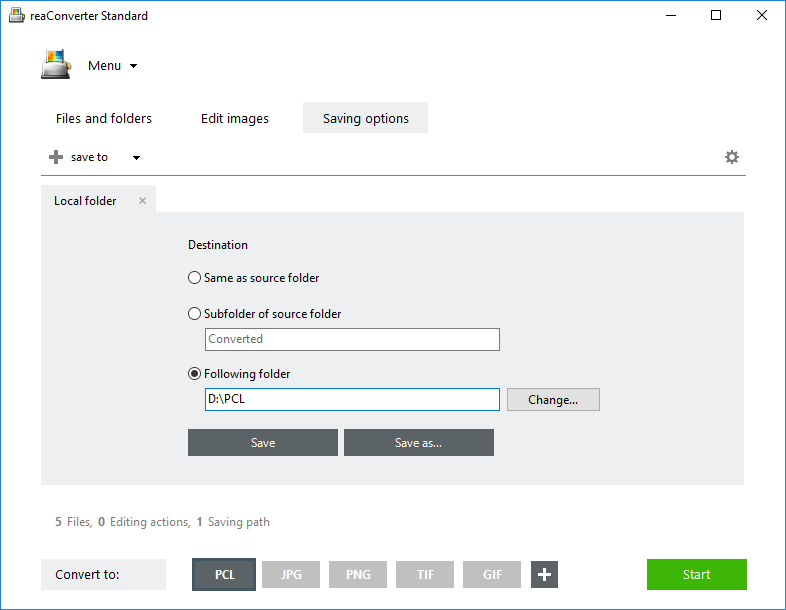 Start reaConverter and add all the PDFs you intend to convert to PCL by using the drag-and-drop tool or by picking them one by one from a local folder. 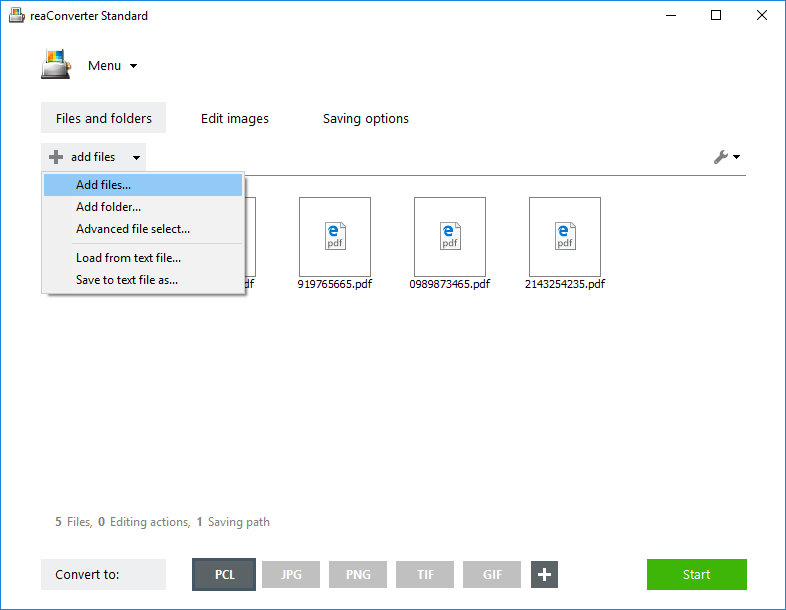 In case the PDFs are mingled with other formats in a folder, you can use the Advanced file select feature that will allow you to automatically select only your desired extension. In the Saving options tab, pick the location of the resulting PCLs. Save them in the source folder, a subfolder or another folder of your choice. Finally, pick PCL from the buttons placed at the bottom of the main window. If it’s not there, click Plus and find it in the newly opened window. Then place the pointer on the upper left corner of the PCL button and click the Settings button. Now you can opt for a particular page size (A4, A6 or other standardized formats), position the input image on the output page and pick the type of printer you will use. reaConverter lets you create PCLs for color or monochrome printers using different types of PCL versions (3, 4, or 5/6). Then simply press Start and enjoy your new PCL files! Advanced users can customize PDF to PCL conversions using command line interface or DLL in manual, automated or scheduled mode. You are welcome to contact our technical support when you have any questions about reaConverter.